Something is terribly wrong at the Tower Mountain Research Station! It’s horror at high altitude when two scientists arrive to replace one of their colleagues whose radio transmissions have grown increasingly erratic and they discover him dead at the radio, once a brilliant man, now only an egghead-flavored Popsicle, but worse, he left the lab a total mess! 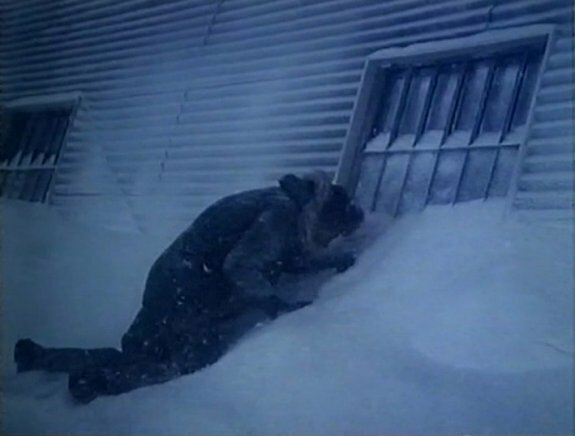 For Frank and Robert though cleaning up the facility, getting the heat running and making sure the primates used in their research are thawed out, is only the beginning of the unspeakable terror that stalks them, even as a powerful snow storm makes it a way there. For instance, Robert is surely driven to the brink of madness from his inability to shoot a game of pool in peace! First of all, Frank is constantly talking to him about station business while he’s trying to make a difficult shot. Worse though is when Frank’s chimp, Geronimo finds his way there, hops on the table and throws the balls everywhere! You don’t have to be Fast Eddie Felson to know that a monkey scuffing up the felt is going to totally ruin your nine ball game! Robert’s inability to finish his research on the effects of oxygen deprivation in accomplishing trick shots and hustling rubes at the local pool hall is only the beginning! There’s also all those damn monkeys screaming and rattling their cages at all hours of the night! And this after Robert almost dies a couple of times outside the station shoveling snow into the water reclamation unit! At some point you have to think Robert is going to give up trying to figure out what is going on and stand around hoping that whatever supernatural force/monster/madman is behind everything will just freaking kill him already! How much worse could it be than that time when he crawled back into the station through a window after he got locked out and promptly fell into a tub of icy water? But just because Frank took kitchen duty instead of 20 below zero snow shoveling duty doesn’t mean that he isn’t being terrorized either! Like that one time something shut off the generator so he couldn’t take a shower! If you’ve ever pulled a shift with a gaggle of cranky chimps, you know how critical it is to take a nice hot shower! 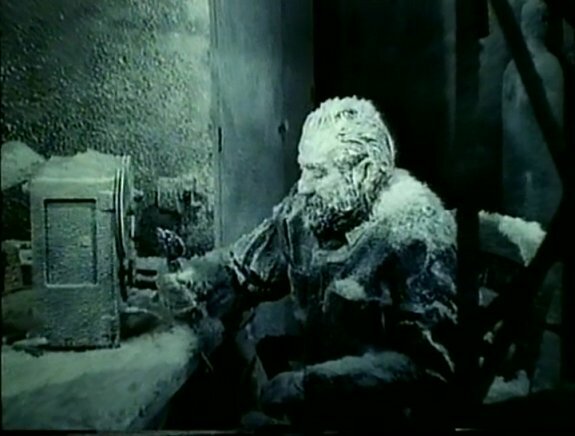 It is a measure of the film’s success that it even uses Frank finally being able to take a shower as a source of suspense. Admittedly, a shower scene of Eli Wallach sudsing up his hair isn’t quite in the same league as Janet Leigh getting slashed in her shower, but Norman Bates never tore up her kitchen in the middle of the night either! Of course we all know it isn’t Robert that Frank has to worry about. After all, everything began with the death of the first scientist long before Frank and Robert arrived. But by the time Robert finally unravels the mystery (based it should be noted on quite scant real evidence), it may already be too late to save everyone! 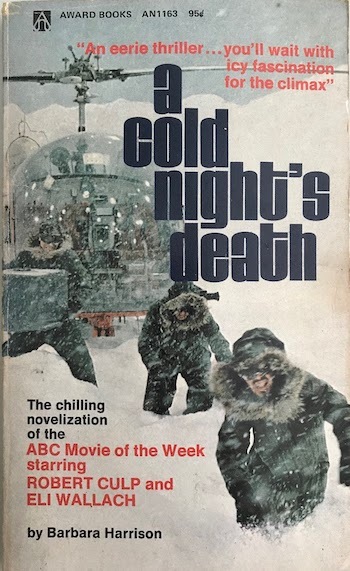 A Cold Night’s Death was an ABC Movie of the Week and its abbreviated running time (74 minutes – presumably so it could air in a 90 minute time slot) and small budget (three actors, a few chimps and one set) are expertly used to serve a spooky story that grabs you with its mystery and keeps you engaged even if you do begin to suspect what’s really happening (spoiler alert: think about what popular science fiction movie franchise was in its heyday at the time). Robert Culp as the intense Robert who believes something strange is going on and Wallace as the disbelieving Frank both need to be convincing since they’re pretty much all there is to the film – and they are. They are good enough that the movie’s heavy handed dialogue between the two spelling out how each of them are different feels entirely unnecessary. Still, much like a less otherworldly The Thing, the inhospitable environment outside and the claustrophobic interior, ably assisted by the film’s odd electronic score, further fuel how unnerving things are as both characters and the audience know there is no help or escape from whatever is occurring. 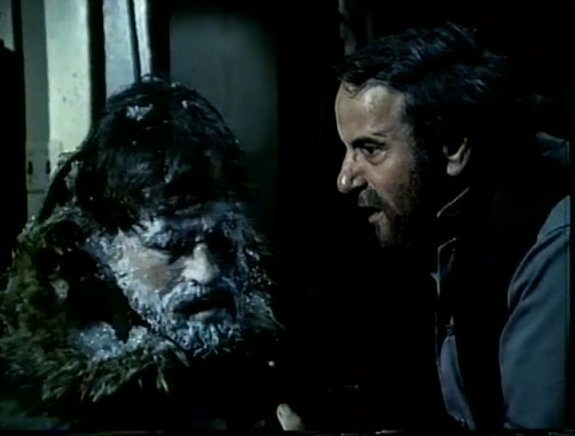 A Cold Night’s Death keeps you guessing as to what the twist will be and as to the characters’ fates until the final unsettling scene. A cool movie that doesn’t monkey around delivering the chills. …the monkeys end up being behind everything? I recall the flick ending with one of the guys being locked up in a room, and watching one of the monkeys on the other side manipulating the lock. It certainly had an impact on me, to remember such an specific scene. Yep – this is that movie. Damn dirty apes.